Historians at Johannes Gutenberg University Mainz (JGU) have spent three years working on an annotated digital edition of the account books known as the Augsburg Master Builders' Ledgers, which are now online. The material offers incomparable insights into the medieval accounting practices in the City of Augsburg in the period 1320 to 1466. The Augsburg Master Builders' Ledgers document all of the imperial city's income and expenditure over the years 1320 to 1800. The master builders entered not only columns of figures in their ledgers, but also recorded a descriptive account of life in their city thanks to various unusual features particular to the accounting practices of the time. In contrast with the account books of many other imperial cities, the Augsburg Master Builders' Ledgers have withstood the ravages of time virtually unscathed. They provide a comprehensive inventory of information of immeasurable value on the economic, financial, social, and cultural history of the early modern period that was previously available only to visitors to the Augsburg City Archive who were familiar with the writing styles employed. It is therefore even more satisfying to have a digital full-text edition in which the material is processed and presented in accordance with the latest technological and methodological standards obtaining in the field of the Digital Humanities. The objective of the project supervised by Professor Jörg Rogge of Mainz University and sponsored by the German Research Foundation (DFG) is to publicize the ledgers dating from 1320 to 1466. The project employs a genuinely digital data processing method based on the virtual research environment "FuD" developed by the Trier Center for Digital Humanities (TCDH). 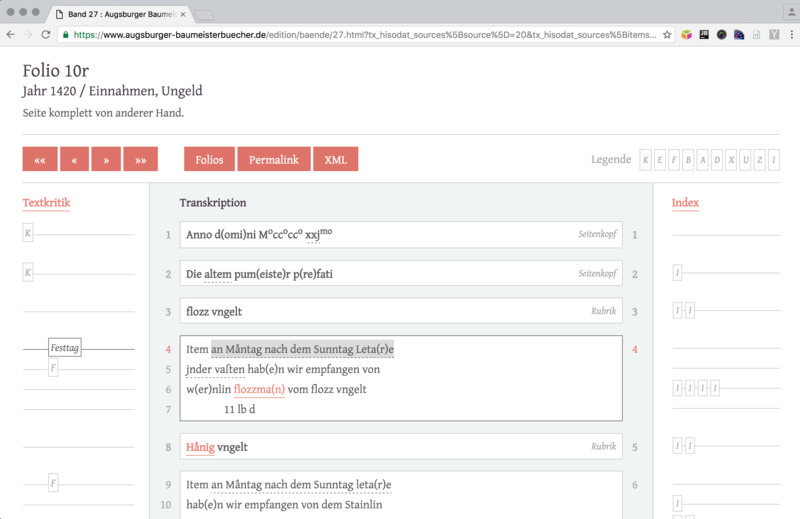 The volumes transcribed and annotated in FuD are then fed into an online framework for historical sources created by the Digital Academy of the Mainz Academy of Sciences and Literature. The project is a continuous work-in-progress so that there will be on-going augmentation of the digital edition. The registers already contain more than 4,500 keywords that reveal the contextual richness of the sources. The provision of links from individual words to online dictionaries provides for better comprehension of the Middle High German original. 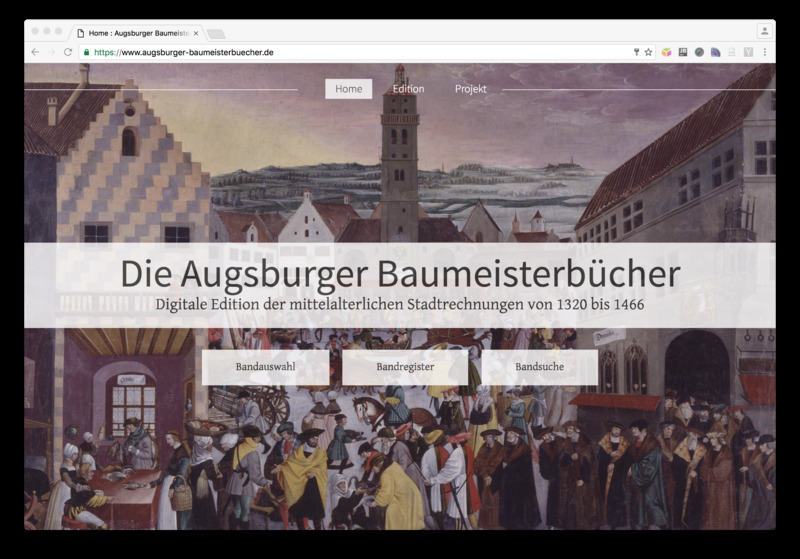 The Mainz-based historians are unable to provide facsimiles of the originals for legal reasons as the Augsburg City Archive has reserved the right to publish digitized reproductions of its holdings. It thus became all the more important to generate a presentation form that offers replications as close as possible to the originals while providing optimum legibility and material that would be of use to academics. The online edition is available on both desktop and mobile end devices. 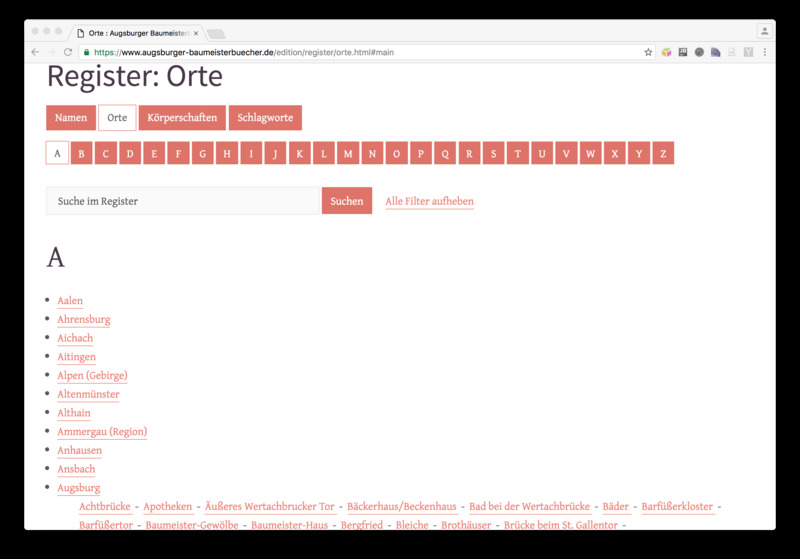 The digital edition represents a permanent and citable resource that offers both a full-text and register search as well as semantic indexing of the material at https://www.augsburger-baumeisterbuecher.de. Source/©: BMB project (in the background: "Augsburg Labor of the Month: October, November, December", Jörg Breu (the Elder), 1475. German Historical Museum (1990/185.4). The registers contain already more than 4,500 keywords.